Second baby girl gift, check! This baby is a bit younger. The post of the sherbet bishop is for a baby that is 5 months old. This baby just turned a month old. So my curve is getting better. 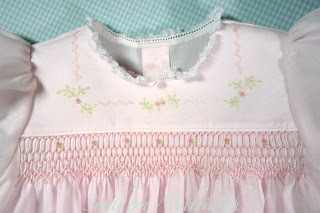 I have made this pattern before for our baby's coming home dress. I love this pattern. 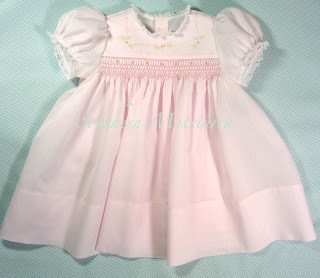 It is Emma's Smocked Dress by Old Fashioned Baby. 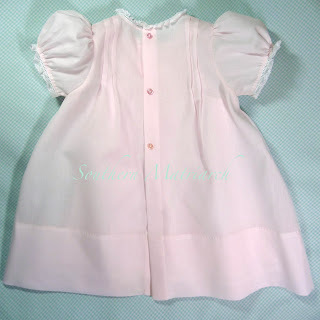 It is quick to smock and put together. It goes together like a dream. I smocked it using the plate included in the pattern, except I omitted the last row of smocking, simply because I decided I was done when I got to that point. No other thought process involved. 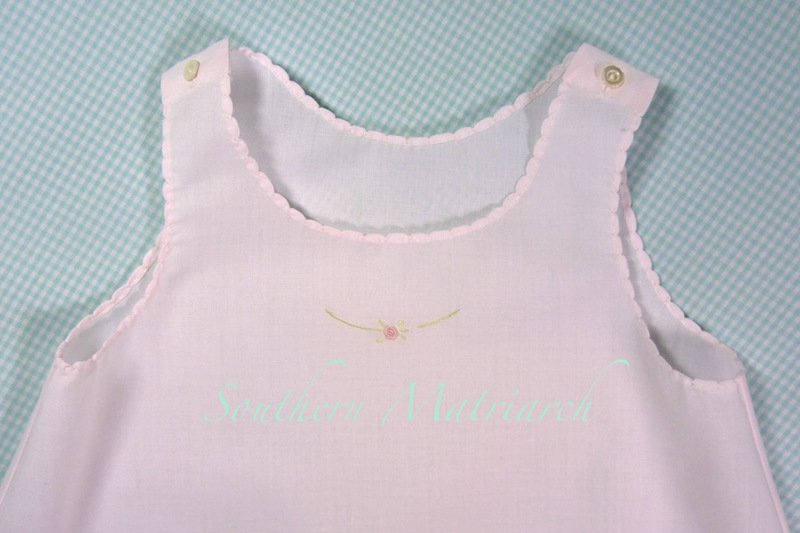 I also simplified the embroidery design, it too is included in the pattern. I used Imperial batiste for this dress. This mommy has two children under 18 months now. She doesn't have time to iron. 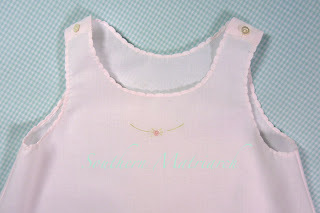 As much as I loved the fabric I used before, this little dress is just as sweet in a simple fabric as well. I also lined and interfaced the yoke. Batiste is a very lightweight fabric. I wanted it to have a little bit more substance. I interfaced it with German interfacing. I have said it before, the back of this dress just makes my heart melt. I don't know why but it does. There is cotton lace at the sleeves and neck edge. One thing I did differently this time was I didn't gather the lace under the sleeve. I like to concentrate my gathers on a puffed sleeve towards the center, so that the gathers at the bottom of the sleeve are directly below the gathers in the sleeve head. This will make your sleeve puff nicely. When I whipped the lace on by hand it made sense to me to only gather it where the sleeve is gathered. I don't know why, but it made sense to me at the time. We will see how it wears. Of course, it needs a slip. The slip is also Imperial batiste. Trimmed with flat lace at the bottom. I used a trick Jeannie taught in the last class I took from her. Even if you are attaching flat lace, still gather it up a tad and then flatten it back out. Just that teeny bit of easing will make the lace lie flat without cupping yet it doesn't look gathered at all. Thank you Jeannie. I finished the slip with a shell stitch hem and a tiny bit of embroidery. The pattern calls for two buttons at the shoulders. No time, just one for now. It works. I hope everyone has something pink in their life. I love pink. Maybe that is why God blessed me with three girls and a granddaughter. I love boys too, but I love pink. 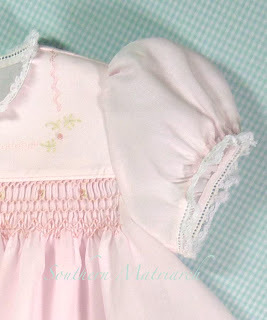 Absolutely love this little dress and all of its wonderful details. 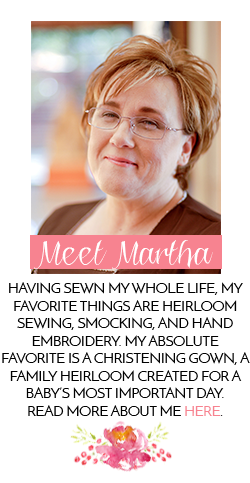 Beautiful work, as usual, Martha. I was blessed with two girls also, but not because I love pink. I think the good Lord felt sorry for me, having been raised with six brothers. I had reached my testosterone quota. What a lucky mom and baby to be receiving this beautiful, sweet little dress! 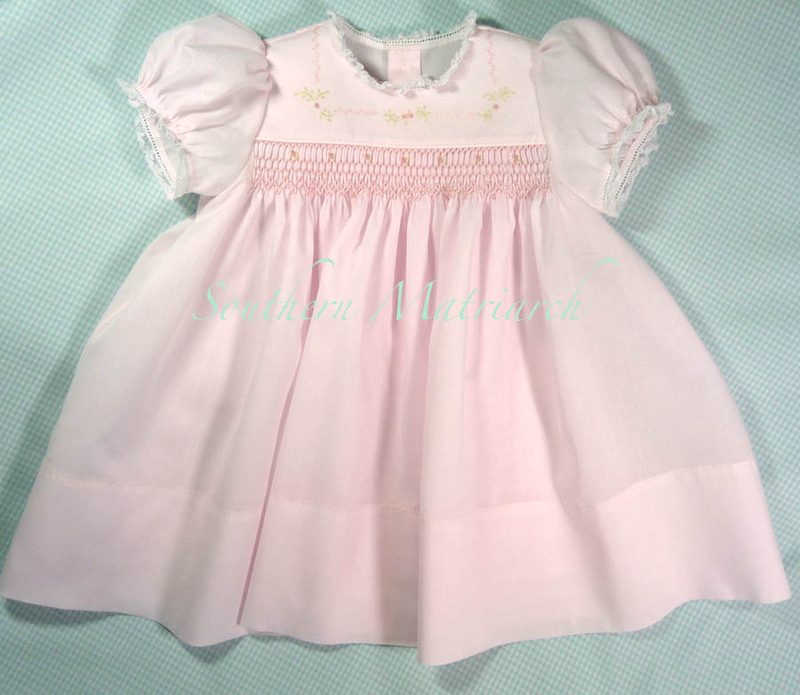 Sweet little dress, it looks beautiful in Imperial, I think poly/cotton sometimes gets a bad rap, this little dress is proof. This is so sweet and beautiful. 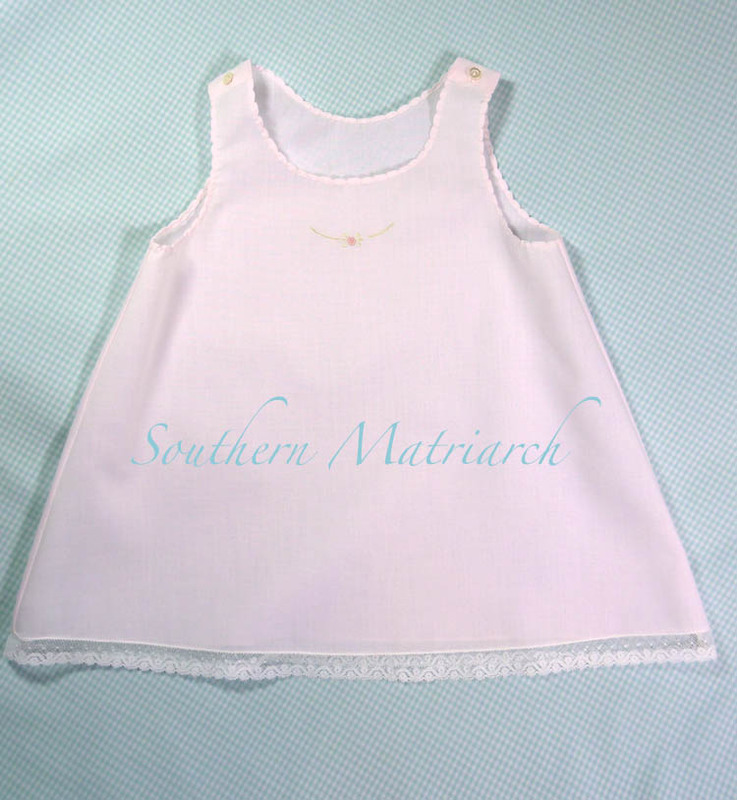 I'm sure Baby will look and feel adorable in it- just like a tiny princess should! So dainty and pretty! Love it... and I just love the little slip - so delicate. Every part of that dress and slip makes my heart melt. Simply gorgeous! Love it! You are so incredibly talented. Beautiful work. I'd like to make a slip like this one but in size 5 and 8. Where can I get a pattern? Thanks. p.s. I love your blog. I learn so much from you. And the work is so inspiring..Sandy. I love the tucks on the back - so delicate and the smocking and embroidery is just the right amount. Your work is impeccable as always.